Weekend Review Kit loves to read. But as we get older we don’t have all the time we’d like to spend with the books on our Must Read List. We can’t remember the last time we read a book the week it came out, even if we did pre-order the thing and take a picture when it arrived because a new book is an excellent reason to get excited. With that in mind, we bring you the Grownups Book Review Club, because we’ve been busy and we just finished it, goddammit. We’re going to try and look at newish books, but every now and then we’ll dive into our bookshelf to cross something of the list of Books We Really Want To Read When This Kid Is Finally Out of our Hair and We Don’t Fall Asleep Watching Project Runway. 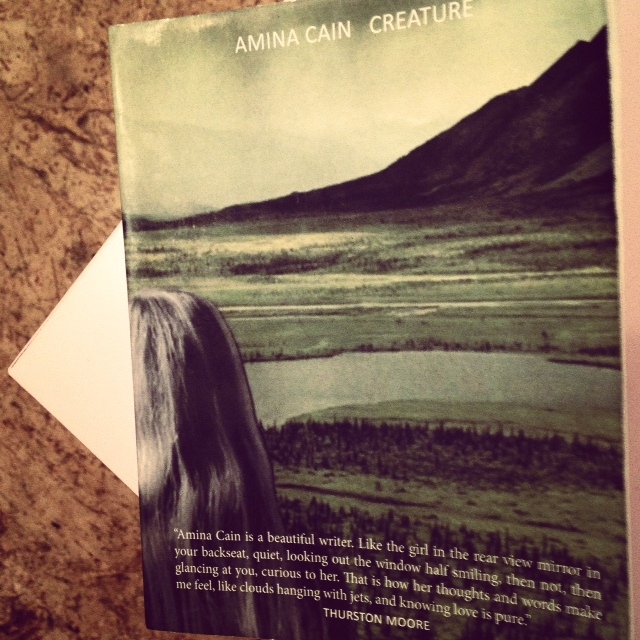 What I have read is Amina Cain’s story collection, Creature, half (along with Renee Gladman’s Ana Patova Crosses a Bridge) of Dorothy’s publishing roster for 2013. Full disclosure: I’ve actually read it a few times, between last spring and last night. I know I should read other books, but I keep going back to it again and again. So, while everyone else is reviewing The Wallcreeper, I’m still pacing around the perimeter of Creature, trying to put my finger on just what kind of being it is. Perhaps those are the most important things you should know: that this book is a presence – it feels alive, you can almost discern its inhale, exhale, through the fibers of the pages – and that it is a book that stays in you as a memory of a feeling more than of specific instances, a book you carry around in your bag months after you’ve finished it because you like knowing it’s there, like reaching in to touch its smooth cover and to press the swollen edges where paper absorbed water. You have to. And here’s why: Mary Burger wrote a brilliant essay called “All New Yorker Stories” that appeared in both the online journal Narrativity and the collection Biting the Error, which begins: “All New Yorker fiction pieces stop at the point where the person makes a bad discovery about himself or herself or the world…Regardless of its narrator, its characters, its particular conceits or conflicts, what anchors each story is the sick feeling at the end.” They land on those harrowing moments like a fly on a glue trap and are held there until those moments become larger than life. As if the whole of our existence is defined and determined by the process of magnifying our basest urges, our fears, confusions, misbehaviors, and abject perspectives. The epiphany has been eclipsed and coopted by the ego, and, if we believe this type of literature, humanity seeks only to discover that we’re worse than we thought we were. This too is narcissism. I am always looking for stories that defy Burger’s astute characterization, and Amina Cain’s are the best I’ve found in a long time. Like, since Italo Calvino long. Instead of that heavy landing, that sick “radiation treatment” feeling, Creature offers something that’s entirely different. It threads together spaces that engender openness, spaces expansive with so much possibility that they cannot be contained by language. Cain writes beautiful traces, these narratives that are, at once, breathy and voluptuous and sparse and spacious, and she allows you to linger in and elongate all the apertures that make us or condition the making of ourselves. The moment remains ephemeral but the space around it is amplified, creating an experience of dilation that transcends our realization that we are terrible, selfish, spiritually impoverished assholes. An experience of dilation that transcends the self altogether. It’s an impression, a sensation, you want to return to, because it reminds you of breathing, the space between the inhale and the exhale, the pause. There is a line that runs through these stories, a river that flows, depositing bits of accumulation here and there – a limp, a leg that is shorter than the other, an arm that bends in a strange way, a maid, a bird’s beak, a coat, a fulgurite – for the reader to gather, reconfigure, and disperse. In an interview with Lauren Wallach for the now-defunct HTMLGIANT, Cain said: “I see the narrators in Creature as different beings but as sharing a single heartbeat. I wanted them to be both separate and connected.” You can hear this heartbeat, or its echoes at least, in the vibrating spaces within each story. And you can hear them striving for connection, almost tearing at their skin to witness and be witnessed by another. “We don’t know each other,” the narrator in the first story, “A Threadless Way,” declares to her friend. And this is the gist, encapsulated in the last line of “Furniture, Table, Chair, Shelves:” we must know each other. “What I appreciate most about compositions, dance, and the air is what I appreciate about people. To go out and meet them you must go incredibly far.” It is this gesture toward encounter that drives these stories, the movement from the vast interiority of the mind outward, the reach toward another creature that circumscribes our individual existence. 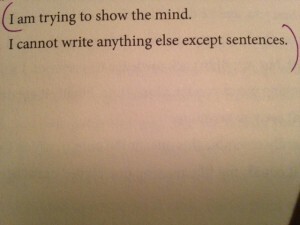 This paradox of the self as both singular and multiple, as not one but not two, resonates, for me, in three interconnected strands: Buddhist conceptions of mind, the hyperaware self-consciousness of the female narrator/writer, and the presence of authors Clarice Lispector, Marguerite Duras, and Hannah Weiner. Each of these three strands can function as a metaphor for the fluctuations of a being/becoming self that reaches out of its own envelopment with the desire to know another. 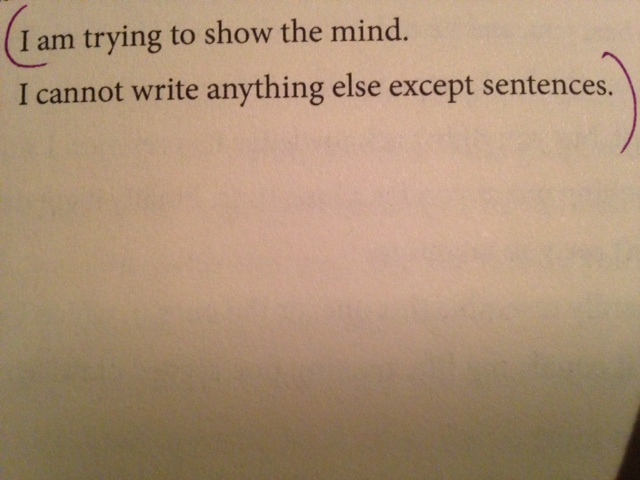 “Attached to a Self” deals most explicitly with the Buddhist path; the narrator studies sutras, goes to the zendo, sits zazen. Yet, in the midst of this purposefully contemplative environment, this deep exploration of what is inward, there is a longing, a need for connection, to a body – “Is the body a religious practice?” – to another – “If we stop talking to each other I’ll have to find a different way to communicate with you.” The urge to commune, our intuitive empathy, is not diminished by meditation. The want cuts through the silence. Hyperconscious self-awareness is a rich lens for exploration, and it can be understood to function as a formal narrative technique of the female writer; a self split in two, at once object of the gaze, conscious of the gaze, and gazing subject. This is especially apparent in “I Will Force This,” whose narrator buries herself in her own sense of abstraction: “I was tempted to move in a way that would make the others in the library think of me strangely, the way I had moved when I was in the gallery. I looked at my hand. How can I re-imagine you?” This uneasy relationship with the gaze is an impediment to authentic connection, to seeing what is. It covers the self in layers, accouterments, which must be peeled back in order to encounter another. In “The Beak of a Bird,” the narrator talks to her cousin, Clarice, about growing up as an only child, the implication that her aloneness was significant in the construction of herself: “ ‘It was my consciousness I was aware of. I was always looking at things, like my own body.’ ” It is this consciousness, or the narrator’s attachment to it, that isolates her now from Clarice. While they share experiences, they cannot quite touch what the other sees. And, in “Queen,” the narrator’s search for comfort is similar: “Last week at the library, I just stood there, witnessing myself and another, shamed.” How can she begin to meet another if her self-concept is stunted by shame? How will she know where she ends and the other begins? And it is Clarice, in “The Beak of a Bird,” from whom the narrator is feeling increasingly alienated by their opposing ideas of beauty and ugliness, who introduces an element of alchemy to these stories. There is something symbolic about the fulgurite she finds, something primitive and neutral, yet something born of unique interaction, of two things touching; lightning and sand become a totally different substance, transformed by their encounter. That is the risk we too must take, this book reminds us. Each time I pick up Creature, I forget about the concept of time, or reading replaces time so that time becomes this tangible event, of moments that flow and with corresponding kinesthetic responses, that is somehow deeper than pleasure. A dwelling in reading as time, being in and not standing outside of it, but within and among the rush of all things, all times, overtaken with the awareness that your intervention is no longer, was never, necessary. Equanimity in the water of the moment, the liquid of time. When you feel like you need something good and beautiful to shock yourself out of your habitual patterns of thought, and, at the same time, you know that expectation is the death of experience: read this book. Like a Zen teacher, Creature will strike you when you’re least expecting it, and it will transform you. The occasional phrase and, in particular, the reference to Mary Burger’s “All New Yorker Stories,” has been borrowed from my personal blog, hertongueishersword.blogspot.com, where I wrote about Creature as a metaphor for a first visit to Seattle. Posted in Arts & Literature, Reviews and tagged amina cain, clarice lispector, creature, danielle dutton, dorothy a publishing project, hannah weiner, her tongue is her sword, marguerite duras, nell zink, the wallcreeper, zen.